There is an extremely popular New York Times infographic that Asian American opponents of affirmative action often share to suggest that elite Ivy League universities have implemented a cap quota on Asian American enrollees. 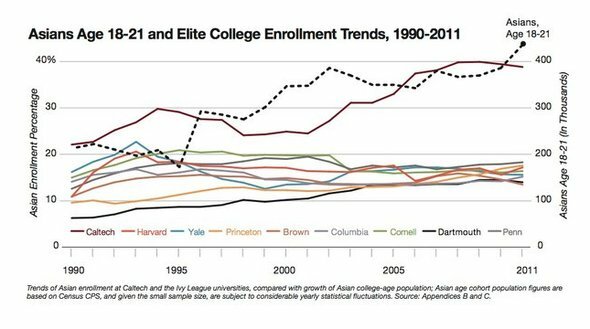 In a nutshell, the infographic (shown above) illustrates that the enrollment of Asian American students at Harvard and other Ivies has fluctuated at around 16-20% for the last twenty years, while enrollment at Caltech has increased since 2000. An overlay of the growth in Asian Americans aged 18-21 suggests that Caltech’s admissions is keeping pace with the growth in the Asian American population, whereas Asian American enrollment at East Coast Ivies are being unnaturally depressed. This is the work of affirmative action, suggests the infographic. The associated New York Times opinion piece (“Statistics Indicate an Ivy League Asian Quota“, penned by uber-conservative anti-affirmative action lobbyist Ron Unz) makes the same argument more explicitly. To Unz’s credit, this infographic is superficially compelling. I’ve been writing in detail about affirmative action for the last year or more, and even I never really questioned these data. I just sort of accepted this graph, if not its larger conclusions. That is, until today, when I sat down and asked myself whether or not Unz’s assertions really made sense mathematically? And y’know what, guys — turns out that everything we thought we knew about this infographic is wrong!